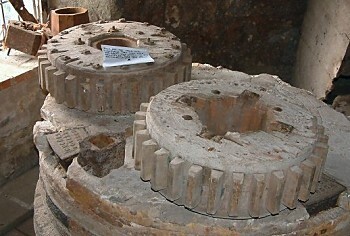 The Stone Nuts are small-cogged wheels that mesh with the Spur wheel, and transfer power to the Millstones. There is one Stone nut per set of Millstones, and in under-driven mills (the power comes from below the stones) like Wheatley, a shaft comes out of the top of the Stone nut and is attached to the Runner stone. Thus when the Main shaft turns the Spur Wheel, the Stone nut is engaged and the Runner Stone turns. Associated with each Milstone is a lever that is found at ceiling level on the ground floor of the mill, this lever was used to engage and disengage each Stonenut as required.